What Fruits Are Mango Alternatives? Mangoes are one of the most popular fruits in the world. They grow naturally in tropical regions and are typically eaten raw, either cubed or pureed. Mango are also stir-fried and used in chutneys and fruit preserves. The fruits are sweet and juicy, with creamy, perfumed flesh. Mangoes are increasingly available year-round in grocery stores in the U.S., but if you can't find them there are some alternatives, which are also useful for people who are allergic to mango. Peaches have their own distinctive flavor and perfume but in terms of color and texture, they are the best fruit to pinch hit for mango in both raw and cooked form. Use ripe peaches instead of mango in just about any recipe, from fruit salsas and fruit salad to baked goods and smoothies. Nectarines are also similar in color and texture to mangoes, if a bit firmer. Nectarines are less perfumed than peaches but otherwise closely aligned, being a cross between a plum and peach. They can be used in salads, smoothies and baked goods. Papaya is another tropical fruit with firm flesh in shades that range from yellow to red. Papaya is sweet and has a mild melon-like perfume. It makes a good substitute for mango in any dish where a tropical note is needed, such as fruit salads, sangria and fruit punch and other mixed fruit dishes. Papaya can be cooked but as a substitute for mango, it works better raw. Apricot makes for a good mango substitute, particularly in juice and pureed forms. Apricots have a similar color and texture to mango plus a strong fruity scent. Apricots stand up to cooking particularly well -- heat enhances both their texture and their taste, so apricot is a particularly good choice when adjusting recipes for baked goods such as upside-down cake. Apricots also work well in the stir-fry dish known as mango chicken. 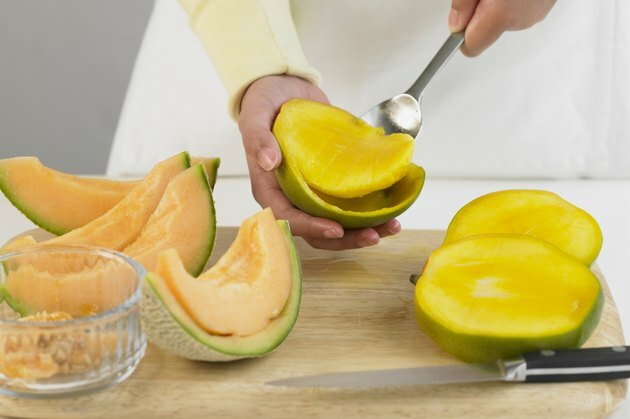 Cantaloupe and other melons can work in place of mango in fruit salads, salsas and smoothies. The texture of melon is not as velvety as mango and its flavor is brighter. Cantaloupe is usually consumed raw and thus should be used only as a substitute for uncooked mango. Although their flavors are not particularly akin to one another, bananas can be substituted for mangoes in mixed fruit dishes. They also work well in smoothies, as bananas provide a creamy texture note similar to that of pureed mango.